If Valentines fell on the weekend you could go mad with hand made chocolates or an elaborate meal for the beloved in your life however it is a Tuesday and we are all either out at work or working from home while wrangling children, the bottom line is only a few very committed people will have the energy or inclination to spend a few hours in the kitchen this evening prepping an intricate Valentines dinner. What most people really want is to spend a couple of quiet hours with the one they love over good food, a higher quality wine than we might usually purchase or perhaps a glass or two of prosecco while happily ignoring the pile of washing in the corner or the toys all over the floor. The one essential component of a Valentines meal is desert, even it is just a bar of gluten free chocolate but these gluten free cookies are so simple I can assure you that you can make them this evening without causing yourself any stress. These manage to be both crisp and chewy and are lovely when sandwiched with a good ice cream. You can also just pile them on a plate as a treat to be enjoyed while snuggled on the couch watching a movie or whatever netflix series you are both currently engrossed in. These are also perfect as a handmade Valentine’s gift, just wrap them in cellophane and tie with a ribbon, I would much rather 12 of these than a dozen roses. When I think cookies, I think of butter, sugar and chocolate and of course that leads me straight to Ina Garten, the queen of all things luxurious and indulgent in the kitchen. I slightly adapted her recipe for chocolate chunk cookies, mainly to make them gluten free but also because I adjusted the amount of chocolate and nuts, increasing the nut to chocolate ratio slightly. I also used milk chocolate instead of semi -sweet because sometimes that is just the chocolate I want. • Line two baking sheets with baking parchment, I ran out of parchment and baked the cookies on buttered baking sheets and they were fine but your life will be easier if you use the baking parchment. • Place the softened butter and the 2 sugars in a bowl and beat until light and fluffy. • Beat in the eggs one at a time and then add the vanilla extract. • Sift the flour, baking powder and salt over the batter and beat in on slow speed until just combined. • Using a wooden spoon stir in the chopped nuts and chocolate. 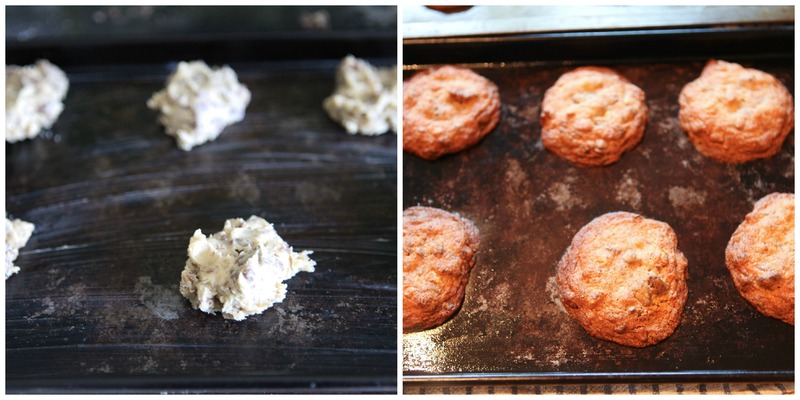 • Place a round tablespoon of the cookie batter on the baking sheet, evenly spaced and the cookies will spread as they cook so leave a bit of space between them, I fit 6 on each baking sheet. 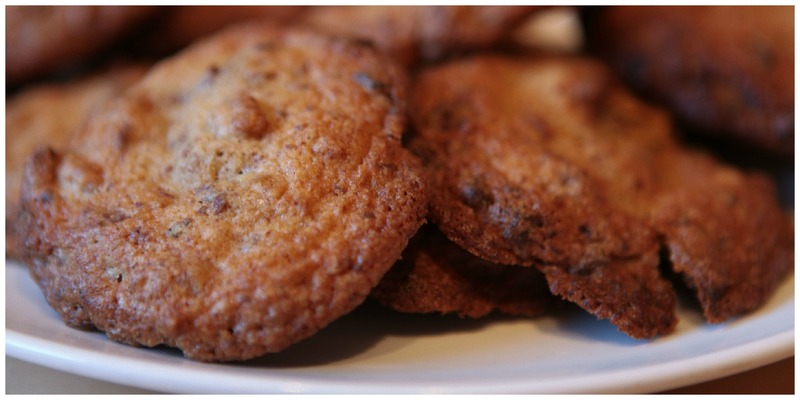 • Bake for 15 minutes, the cookies will be soft when they come out but will crisp up as they cool. 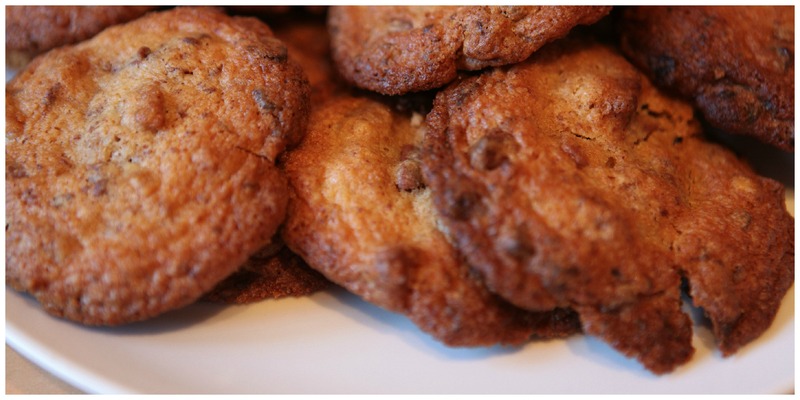 • Allow to cool for a few minutes on the tray before carefully moving the cookies to a cooling rack with a palette knife. • Repeat the process, you should get about 36 cookies out of the batter. • Once cooled you can store the cookies in an airtight container.